Lewis lung adenocarcinoma growth was retarded by the oral administration of delta-9-tetrahydrocannabinol, delta-8-tetrahydrocannabinol, and cannabinol (CBN), but not cannabidiol (CBD). Animals treated for 10 consecutive days with delta-9-THC, beginning the day after tumor implantation, demonstrated a dose-dependent action of retarded tumor growth. Mice treated for 20 consecutive days with delta-8-THC and CBN had reduced primary tumor size. CBD showed no inhibitory effect on tumor growth at 14, 21, or 28 days. Delta-9-THC, delta-8-THC, and CBN increased the mean survival time (36% at 100 mg/kg, 25% at 200 mg/kg, and 27% at 50 mg/kg;, respectively), whereas CBD did not. Delta-9-THC administered orally daily until death in doses of 50, 100, or 200 mg/kg did not increase the life-spans of (C57BL/6 X DBA/2) F (BDF) mice hosting the L1210 murine leukemia. However, delta-9-THC administered daily for 10 days significantly inhibited Friend leukemia virus-induced splenomegaly by 71% at 200 mg/kg as compared to 90.2% for actinomycin D. Experiments with bone marrow and isolated Lewis lung cells incubated in vitro with delta-8-THC and delta-9-THC showed a dose-dependent (10 -4 10 -7) inhibition (80-20%, respectively) of tritiated thymidine and 14C -uridine uptake into these cells. CBD was active only in high concentrations (10-4). J Natl Cancer Inst 55: 597-602, 1975. Investigations into the physiologic processes affected by the psychoactive constitutuents of marihuana [delta-9-tetrahydrocannabinol (delta-9-THC) and delta-8-tetrahydrocannabinol (delta-8-THC)] purified from Cannabis sativa are extensive (1). However, only recently have attempts been made to elucidate the biochemical basis for their cytotoxic or cytostatic activity. Leuchtenberger et al. (2) demonstrated that human lung cultures exposed to marihuana smoke showed alterations in DNA synthesis, with the appearance of anaphase bridges. Zimmerman and McClean (3), studying macromolecular synthesis in Tetrahymena, indicated that very low concentrations of delta-9-THC inhibited RNA, DNA, and protein synthesis and produced cytolysis. Stenchever et al. (4) showed an increase in the number of damaged or broken chromosomes in chronic users of marihuana. Delta-9-THC administered iv inhibited bone marrow leukopoieses (5), and Kolodny et al. (6) reported that marihuana ;may impair testosterone secretion and spermatogenesis. Furthermore, Nahas et al. (7) showed that in chronic marihuana users there is a decreased lymphocyte reactivity to mitogens as measured by thymidine uptake. These and other (8) observations suggest that marihuana (delta-9-THC) interferes with vital cell biochemical processes, though no definite mechanism has yet been established. A preliminary report from this laboratory (9) indicated that the ability of delta-9-THC to interfere with normal cell functions might prove efficacious against neoplasms. This report represents an effort to test various cannabinoids in several in vivo and in vitro tumor systems to determine the kinds of tumors that are sensitive to these compounds and reveal their possible biochemical sites of action(s). The tumor systems used were the Lewis lung adenocarcinoma, leukemia L1210, and B-tropic Friend leukemia. Lewis lung tumor: For the maintenance of the Lewis lung carcinoma, approximately 1-mm3 pieces of tumor were transplanted into C57BL/6 mice with a 15-gauge trocar. In experiments involving chemotherapy, 14- to 18-day-old tumors were excised, cleared of debris and necrotic tissue, and cut into small fragments (=1mm3). Tumor tissue was then placed in 0.25% trypsin in Dulbecco's medium with 100 U Penicillin/ml and 100 mcg streptomycin/ml. After 90 minutes' incubation at 22 Degrees C, trypsin action was stopped by the addition of complete medium containing heat-inactivated fetal calf serum (final concentration, 20%). Cells were washed two times in complete medium, enumerated in a Coulter counter (Model ZB1) or on a hemocytometer, and suspended in serum-free medium at a concentration of 5 X 10 6 cells / ml. Next 1 X 10 6 cells were injected into the right hind gluteur muscle, and drugs administered as described in "Results." Standard regimens provided for 10 consecutive daily doses beginning 24 hours after tumor inoculation. Body weights were recorded before tumor inoculation and weekly for 2 weeks. Tumor size was measured weekly for the duration of the experiment and converted to mg tumor weight, as described by Mayo (10). Friend leukemia:B-tropic Friend leukemia virus (FLV) was maintained in BALB / c mice, and drug evaluation performed in the same animals. Pools of virus were prepared from the plasma of mice given FLV and stored at -70 Degrees C. In experiments with FLV, 0.2 ml of a 1/20 dilution of plasma (derived from FLV-infected mice) in medium was inoculated ip into BALB / c mice. 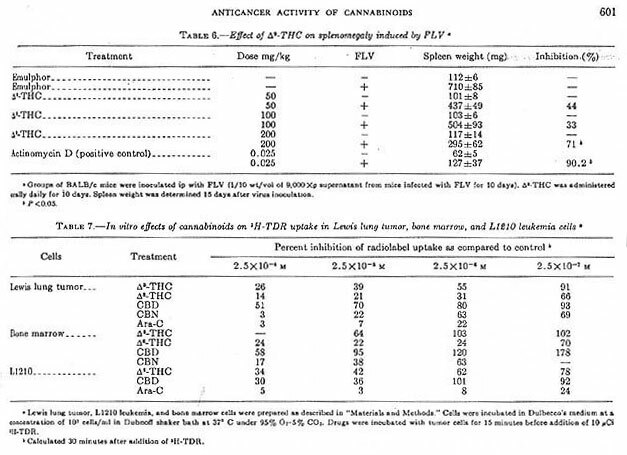 Cannabinoids were administered orally daily for 10 consecutive days beginning 24 hours after virus inoculation. Twenty-four hours after the last drug administration, the mice were killed by cervical dislocation, and the spleens removed and weighed. Mice not given FLV were treated as described above, to evaluate possible drug-induced splenomegaly. L1210 leukemia: The murine leukemia L1210 was maintained in DBA/2 mice by weekly transfers of 10 (to the fifth power) cells derived from the peritoneal cavity. In these experiments, 10 (fifth power) leukemia cells were inoculated ip into (C57BL/6 X DBA/2) F 1 (BDF 1) mice, and the mice were treated daily for 10 consecutive days beginning 24 hours after tumor cell inoculation. Mean survival time was used as an index of drug activity. Lewis lung tumor: We obtained isolated Lewis lung tumor cells by subjecting 1-mm (third power) sections of tumor to 0.25% trypsin at 22 degrees C and stirring for 60-90 minutes. After trypsinization, the cells were centrifuged (1,000 rpm for 10 min) and washed twice in Dulbecco's medium containing 20% heat-inactivated fetal calf serum. They were then reconstituted to 10 7 cells/ml of 200 mm glutamine, 5,000 U penicillin, and 5,000 mcg streptomycin. Tumor cells (3-6 ml) were dispensed into 25-ml Erlenmeyer flasks and preincubated with eithe the drug or the drug vehicle for 15 minutes in a Dubnoff metabolic shaker at 37 degrees C in an atmosphere of 5% CO2--95% )2. After preincubation, 10 ucl tritiated thymidine (3H-TDR) (10 uCi, 57 Ci/mmole; New England Nuclear Corp., Boston, Mas.) was added to each flask and incubated for various times, after which 1-ml aliquots were removed and placed in 10 X 75-mm test tubes containing 1 ml 10% trichloroacetic acid (TCA) at 4 degrees C. The TCA-precipated samples were then filtered on 0.45-u Millipore filters and washed twice with 5 ml of 10% TCA at 4 degrees C. The filters were transferred to liquid scintillation vials and counted in a toluene cocktail containing Liquifluor (New England Nuclear Corp.) (4 liters toluene to 160 ml Liquifluor). Samples were then counted in a liquid scintillator. Bone marrow: Bone marrow cells were derived from the tibias and fibulas of BDF 1 mice. One ml Dulbecco's medium containing 1 U heparin/ml was forced through each bone by a 1-ml syringe with a 26-gauge needle. The cells were washed three times, nucleated cells were enumerated on a hemocytometer, and cell viability was ascertained by trypan blue exclusion. Cell number was adjusted to 10 (seventh) cells/ml with heparin-free Dulbecco's medium and incubated at 4 degrees C for 15 minutes. Bone marrow cells were then dispensed (3-5 ml) into a25-ml Erlenmeyer flasks containing the test drug or the drug vehicle. This preincubation period was followed by the addition of 10 ul 3H-TDR and the procedures done as outlined for the isolated Lewis lung cells. L1210: L1210 cells were derived from DBA/2 mice as described above. They were obtained from DBA/2 mice and inoculated 7 days before the experiment by the peritoneal cavity being flushed with 10 ml Dulbecco's medium containing heparin (5 u/ml). The cells were washed three times in medium, and the final medium wash did not contain heparin. The cells were resuspended at 10 (seventh) cells/ml and treated as described above. Cells were routinely counted with a hemocytometer for the determination of cell viability with trypan blue; for Lewis lung tumor and L1210 cells, a Coulter apparatus (Mode ZB1) was also used. All other reagents were of the highest quality grade available. Actinomycin D, 5-fluorouracil (5-FU), and cytosine arabinoside (ara-C) were provided by the Drug Development Branch, National Cancer Institute (NCI). The structures of the four compounds are shown in text-figure 1. All occur naturally in marihuana and were chemically synthesized. These drugs were provided by the National Institute on Drug Abuse or the Sheehan Institute for Research, Cambridge, Massachusetts. 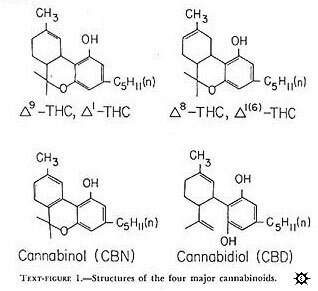 In the preparation of the drugs, the cannabinoids were complexed to albumin or solubilized in Emulphor-alcohol. Both preparations produced similar antitumor activity. With albumin, the cannabinoids were prepared in the following manner: A stock solution of 150 mg cannabinoid per ml absolute ethanol was made. Six ml of this solution was placed in a 200-ml flask. The ethanol was evaporated off under a stream of nitrogen and 2,100 mg lyophilized bovine serum albumin (BSA) added. After the addition of 20 ml distilled water, the substances were stirred with a glass rod in a sonicator until a good suspension was achieved. Sufficient distilled water was the aldded to make the desired dilution. Concentrations were routinely checked with a gas chromatograph. When Emulphor-alcohol was used as the vehicle, the desired amount of cannabinoid was sonicated in a solution of equal volumes by absolute ethanol and Emulphor (El-620; GAF Corp., New York, N.Y.) and then diluted with 0.15 N NaCL for a final ratio of 1: 1: 4 (ethanol: Emulphor: NaCL). Delta-9-THC, delta-8-THC, and cannabinol (CBN) all inhibited primary Lewis lung tumor growth, whereas cannabidiol (CBD) enhanced tumor growth. Oral administration of 25, 50, or 100 mg delta-9-THC/kg inhibited primary tumor growth by 48, 72, and 75% respectively, when measured 12 days post tumor inoculation (table 1). On day 19, mice given delta-9-THC had a 34% reduction in primary tumor size. On day 30, primary tumor size was 76% that of controls and only those given 100 mg delta-9-THC/kg had a significant increase in survival time (36%). Mice treated with a delta-9-THC showed a slight weight loss over the 2-week period (average loss, 0.3 g at 50 mg/kg and 0.1 g at 100 mg/kg). This can be compared to cyclo-ohosphamide, which caused weight loss approaching 20% (table 2). Delta-8-THC activity was similar to that of delta-9-THC when administered orally daily until death (table 2). However, as with delta-9-THC, primary tumor growth approached control values after 3 weeks. When measured 12 days post tumor inoculation, all doses (50-400 mg/kg) of delta-8-THC inhibited primary tumor growth between 40 and 60%. Significant inhibition was also seen on day 21, which was comparable to cyclophosphamide-treated mice. Although this was not the optimum regim;en for cyclophosphamide, it was the positive control protocol provided by the NCI (11). All mice given delta-8-THC survived significantly longer than controls, except those treated with 100 mg/kg. Mice given 50, 200, and 400 mg/kg delta-8-THC had an increased life-span of 22.6, 24.6, and 27.2%, respectively, as compared to 33% for mice treated with 20 mg cyclophosphamide/kg. Pyran copolymer, an immunopotentiator (12) when administered at 50 mg/kg, also significantly increased the survival time of the animals (39.3%). CBN, administered by gavage daily until death, demonstrated antitumor activity against the Lewis lung carcinoma when evaluated on day 14 post tumor inoculation (table 3). Primary tumor growth was inhibited by 77%, at doses of 100 mg/kg on day 14 but only by 11% on day 24. At 50 mg/kg on day 14 but only by 11% on day 24. At 50 mg/kg, CBN inhibited primary tumor growth by only 32% when measured on day 14, and no inhibition was observed on day 24; however, these animals did survive 27% longer. CBD, administered at 25 or 200 mg/kg daily until death, showed no tumor-inhibitory properties as measured by primary Lewis lung tumor size or survival time (table 4). In this experiment, CBD-treated mice showed enhanced primary tumor growth. However, the control tumor growth rate in this experiment was decreased as compared to the previous studies. 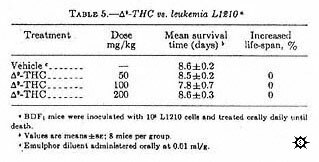 Survival time of BDF 1 mice hosting L1210 leukemia was not prolonged by delta-9-THC treatment (table 5). Mice treated with delta-9-THC at doses of 50, 100, and 200 mg/kg administered orally daily until death, survived 8.5, 7.8, and 8.6 days, respectively, as compared to 8.6 days for mice treated with the diluent. However, delta-9-THC inhigited FLV-induced splenomegaly by 71% at 200 mg/kg as compared to 90.2% for the positive control actinomycin D (0.25 mg/kg). Although there was a dose-related inhibition, only the high dose was statistically significant(table 6). Isolated cells incubated in vitro represent a simple, reliable, and, hopefully, predictive method for the monitoring of the effects of agents on several biochemical parameters at the same time. The incorporation of 3H-TDR into TCA-precipitable counts in isolated Lewis lung cells is shown in text-figure 2. Similar types of curves were seen for bone marrow and L1210 cells. In all instances, for 15-45 minutes there was a linear increase in 3H-TDR uptake into the TCA-precipitable fraction. Qualitatively, similar data (not shown) were seen after a pulse with 14C-uridine. Actinomycin D (1 mcg/ml) preferentially inhibited 14C-uridine incorporation after uridine uptake had decreased to less than 30% that of control (data not shown). This is indirect evidence that we were measuring RNA synthesis. 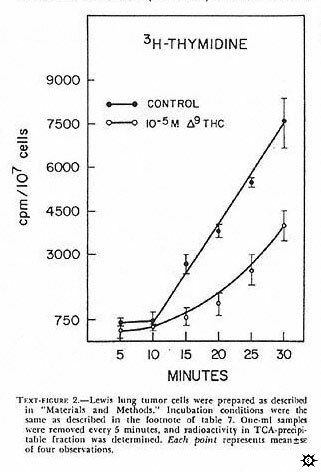 Experiments (data not shown) done with 5-FU (10 -4 M) indicated that, in isolated bone marrow cells, both thymidine uptake with time by delta-9-THC (10 -5 M) on Lewis lung cells is depicted in text-figure 2. In this experiment, delta-9-THC caused a nonlinear uptake of 3H-TDR. At 30 minutes, uptake of 3H-TDR into the acid-precipitable fraction was about 50% that of control Longer incubations (i.e., 60 min) did not significantly change the uptake pattern for control and de;ta-9-THC treated tumor cells. The effect of several cannabinoids on the uptake of 3H-TDR into cells incubated in vitro indicated that delta-9-THC, delta-8-THC, and CBN produced a dose-dependent inhibition of radiolabel uptake in the three cell types (table 7). These results, presented as percent inhibition of radiolabel uptake as compared to control, represented an effectof cannabinoids on one aspect of macromolecular synthesis. CBD was the least active of the cannabinoids, but showed its greatest activity in the L1210 leukemia cells. Other data (not shown) indicate that these compounds similarly effect the uptake of 14C-uridine into the acid-precipitable fraction. Ara-C markedly inhibited 3H-TDR uptake more dramatically than did the cannabinoids (table 7). Note that delta-9-THC exhibited inhibitory properties in the isolated Lewis lung tumor and L1210 cells at concentrations that did not interfere with thymidine uptake into bone marrow cells. At certain concentrations of CBD (2,5 X 10 -6 and 2.5 X 10 -7M), radiolabel uptake was consistently stimulated in bone marrow cells and in several experiments with the isolated Lewis lung cells. We investigated four cannabinoids for antineoplastic activity against three animal tumor models in vivo and for cytotoxic or cystostatic activity in two tumor cell lines and bone marrow cells in vitro. The cannabinoids (delta-9-THC, delta-8-THC, and CBN) active in vivo against the Lewis lung tumor cells are also active in the in vitro systems. The differential sensitivity of delta-9-THC against Lewis lung cells versus bone marrow cells is unique in that delta-8-THC and CBN are equally active in these systems. Johnson and Wiersma (5) reported that delta-9-THC administered iv caused a reduction in bone marrow metamyelocytes and an increase in lymphocytes. It is unclear from the data whether this is a depression of myelopoiesis or if it represents a lymphocyte infiltration into the bone marrow. The use of isolated bone marrow cells, which represent a nonneoplastic rapidly proliferating tissue, enables the rapid evaluation and assessment of drug sensititity and specificity, and thereby may predict toxicity related to bone marrow suppression. CBD showed noninhibitory activity either against the Lewis lung cells in vivo or Lewis lung and bone marrow cells in vitro at 10 -5M an 10 -6M, respectively. Indeed, the tumor growth rate in mice treated with CBD was significantly increased over controls. This may, in part, be the consequence of the observation made in vitro (i.e., 10 -7M CBD stimulated thymidine uptake), which may be reflected by an increased rate of tumor growth. One problem related to the use of cannabinoids is the development of tolerance to many of its behavioral effects (13). It also appears that tolerance functions in the chemotherapy of neoplsms in that the growth of the Lewis lung tumor is initially markedly inhibited but, by 3 weeks, approaches that of vehicle-treated mice (tables 1, 3). This, in part, may reflect drug regimens, doses used, increased drug metabolism, or conversion to metabolites with antagonistic actions to delta-9-THC. It may also represent some tumor cell modifications rendering the cell insensitive to these drugs. Of further interest was the lack of activity of delta-9-THC against the L1210 in vivo, whereas the invitro L1210 studies indicated that delta-9-THC could effectively inhibit thymidine uptake. The apparent reason for this discrepancy may be related to the high growth fraction and the short doubling time of this tumor. The in vitro data do not indicate that the cannabinids possess that degree of activity; e.g., ara-C, which "cures"L1210 mice, is several orders of magnitude more potent on a molar basis than delta-9-THC in vitro. Inhibition of tumor growth and increased animal survival after treatment with delta-9-THC may, in part, be due to the ability of the drug to inhibit nucleic acid synthesis. Preliminary data with Lewis lung cells grown in tissue culture indicate that 10 -5M delta-9-THC inhibits by 50% the uptake of 3H-TDR into acid-precipitable counts over a 4-hour incubation period. Simultaneous determination of acid-soluble fractions did not show any inhibitory effects on radiolabeled uptake. Therefore, delta-9-THC may be acting at site(s) distal to the uptake of precursor. We are currently evaluating the acid-soluble pool to see if phosphorylation of precursor is involved in the action of delta-9-THC. These results lend further support to increasing evidence that, in addition to the well-known behavioral effects of delta-9-THC, this agent modifies other cell responses that may have greater biologic significance in that they have antineoplastic activity. The high doses of delta-9-THC (i.e., 200 mg/kg) are not tolerable in humans. On a body-surface basis, this would be about 17 mg/m(2) for mice. Extrapolation to a 60-kg man would require 1,020 mg for comparable dosage. The highest doses administered to man have been 250-300 mg (14). Whether only cannabinoids active in the central nervous system (CNS) exhibit this antineoplastic property is not the question, since CBN, which lacks marihuana-like psychoactivity, is quite active in our systems (15). With structure-activity investigations, more active agents may be designed and synthesized which are devoid of or have reduced CNS activity. That these compounds readily cross the blood-brain barrier and do not possess many of the toxic manifestations of presently used cytotoxic agents, makes them an appealing group of drugs to study. Supported by Public Health Service grant DA00490 from the National Institute on Drug Abuse, Health Services & Mental Health Administration; by a grant from the Alexander and Margaret Stewart Trust Fund; and by an institutional grant from the American Cancer Society.